Visceral artery aneurysms (VAAs) are an uncommon but well-recognized condition. Hepatic artery aneurysms (HAAs) represent 14%–20% of all VAAs. Aneurysms and pseudoaneurysms (HAP) of the hepatic artery are equally common. 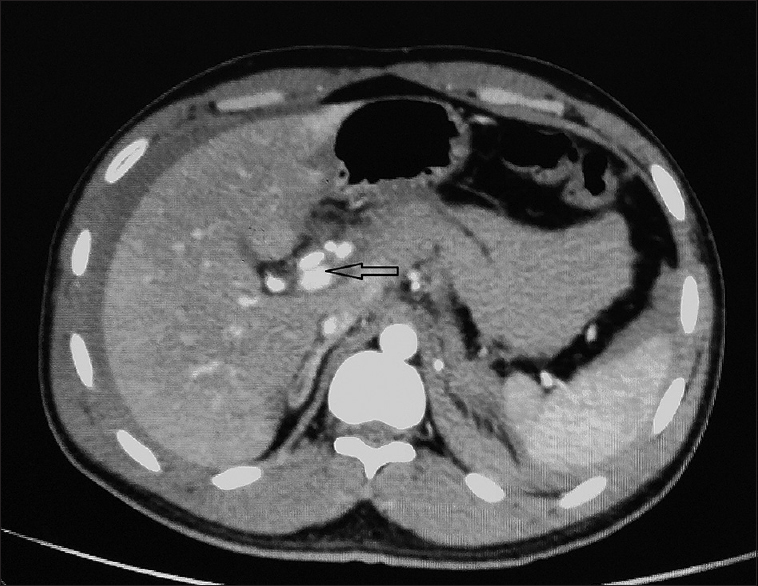 Post-traumatic hepatic artery pseudoaneurysm is an uncommon delayed complication of blunt liver trauma. They are usually asymptomatic and found at follow-up by computed tomography (CT) or ultrasound. They have an unpredictable clinical course and may present acutely with rupture. However, early rupture of post-traumatic hepatic artery peudoaneurysm is a rare complication which can be catastrophic if not treated immediately. There are no reported cases of ruptured post-traumatic hepatic artery pseudoaneurysm within 12 h of trauma which has required complete arterial devascularization of the liver. A 27-year-old male presented with history of fall from 10 feet height, 4 h earlier. He sustained injuries over his chest and abdomen. He complained of pain in the right chest and right side of abdomen. His management was started as per the ATLS protocol. He was conscious, oriented. His air entry was bilaterally normal. He had a tachycardia of 90–100 beats/min. His blood pressure at presentation was 100/80mm Hg. There were no other external injuries. The patient was reassessed every hour to look for any hemodynamic deterioration. Ultrasound showed free fluid in the peritoneal cavity. computed tomography (ACT) showed a pseudoaneurysm of hepatic artery proper (HA) just proximal to its bifurcation into right and left hepatic arteries [Figure 1]. There was a hematoma in the peri-hepatic space with a mild hemoperitoneum. A digital subtraction angiography showed a 2-cm aneurysm at junction of right and left hepatic arteries [Figure 2] with no active bleeding. Endovascular intervention was considered but was not attempted due to the difficult location of aneurysm and a higher risk of failure. While an elective intervention was being planned, the patient developed sudden hypotension (BP 60/40 mmHg) and disorientation. Decision to perform an emergency laparotomy was taken. On exploratory laparotomy, there was about 500 mL of blood in the peritoneal cavity. There was a contusion in the hepatoduodenal ligament. 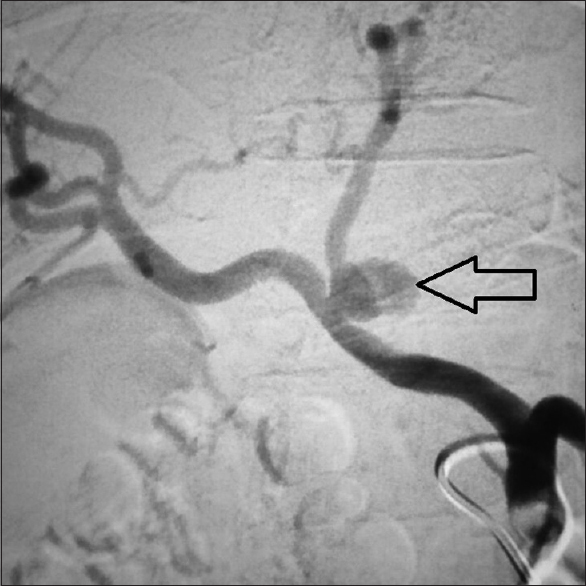 An actively bleeding aneurysm of size 2 × 2 cm was identified proximal to the bifurcation of hepatic artery proper (HA). Double ligation of HA and right and left hepatic arteries was done. However, bleeding continued through retrograde flow from gastroduodenal artery, and hence ligation of gastrodudenal artery was also done. There was no immediate discoloration of the liver. Two units of packed cells were transfused intraoperatively. There were no associated injuries to the adjacent organs. Postoperative recovery was uneventful. His transaminases were 350 and 370 U/L (AST and ALT) on day 1 which reduced to 100 and 120 U/L by day 5. He was discharged from the hospital on day 8. At follow-up of 10 months, he is symptom-free. Aneurysms are dilatation of arteries to more than 1.5 times their usual size. VAAs are most commonly seen in the splenic artery (60%) followed by hepatic artery. Pseudoaneurysms occur due to a leakage from an injured artery into the surrounding tissues forming a cavity outside the artery. It can be distinguished from hematoma as it continues to communicate with the arterial lumen resulting in a high-pressure cavity with the risk of rupture. Increased use of percutaneous interventional therapy of the liver has resulted in an increase in the incidence of intrahepatic pseudoaneurysms. HAPs are usually described as a late complication of hepatic trauma. Clinical presentation of HAPs may vary from incidental detection to an emergency presentation with rupture. Extrahepatic aneurysms rupture into the peritoneum, whereas intrahepatic aneurysms may rupture into biliary tree causing Quinke's triad of pain, jaundice, and hemobilia. Since the clinical course of these aneurysms is unpredictable with a possibility of rupture and acute hemodynamic compromise, detection of HAP warrants a definite intervention irrespective of the size or symptoms. Management options vary in acute management of ruptured HAP or elective management. Therapeutic options for HAP include angiographic stent placement or embolization, surgical ligation, and resection with or without reconstruction. The main determinants of modality will be the need to maintain end-organ perfusion and comorbidities for surgical treatment. The aim of treatment is to occlude or excise aneurysm with all attempts to maintain arterial supply to the liver. Interventional radiographic techniques with deployment of covered stents across aneurysm help achieve this aim and have become the modality of choice. Even in a ruptured HAP, angiographic intervention may be attempted, provided the patient is hemodynamically stable. Stent deployment may be challenging in lesions close to bifurcation of the hepatic artery as in our case. Successful stent deployment can result in aneurysm thrombosis in more than 90% and size reduction in more than 80% of cases with low rates (<10%) of arterial thrombosis. If stent deployment is not feasible, coil embolization of the afferent and efferent feeders of the HAA can be attempted, with good results. Complications of embolization are due to loss of arterial supply to the liver and biliary tree and include gallbladder ischemia, hepatic abscess, and secondary biliary cirrhosis. Surgical ligation can be considered for a HAA located in CHA. Here, retrograde flow from the superior mesenteric artery through the gastroduodenal branch may maintain hepatic arterial flow. Ligation without reconstruction may also be done at the time of emergency surgery for a ruptured aneurysm for vascular control. Resection of aneurysm remains the mainstay of surgical treatment. Arterial reconstruction can be accomplished by end-to-end anastomosis or using an autologous vein or prosthetic interposition graft. Prosthetic material may be used in the absence of local contamination. The long-term results of arterial reconstruction for VAA are excellent with reported patency of 95% at 10 years. In our patient, the location of aneurysm was close to bifurcation, and proximal and distal hepatic artery ligation was done along with ligation of gastroduodenal artery. Thus, complete arterial devascularization of the liver was performed with no ischemic complications of the gall bladder or liver. The decision of complete devasularization of liver was taken as an emergency life-saving procedure. However, it must be noted that in stable patients, arterial reconstruction should be planned. Even though rupture of HAPs is well reported, there is no report of a ruptured HAP occurring within 24 h after trauma. This case demonstrates the importance of early recognition of post-traumatic visceral artery pseudoaneurysm by contrast-enhanced CT and close monitoring of these patients even if there is no demonstrable active bleeding at the time of imaging. Immediate surgical intervention should be performed in a hemodynamically unstable patient. Hulsberg P, Garza-Jordan J de la, Jordan R, Matusz P, Tubbs RS, Loukas M. Hepatic aneurysm: A review. Am Surg 2011;77:586-91. Shanley CJ, Shah NL, Messina LM. Common splanchnic artery aneurysms: Splenic, hepatic, and celiac. Ann Vasc Surg 1996;10:315-22. Francisco LE, Asunción LC, Antonio CA, Ricardo RC, Manuel RP, Caridad MH. Post-traumatic hepatic artery pseudoaneurysm treated with endovascular embolization and thrombin injection. World J Hepatol 2010;2:87-90. Pearce BJ. Does endovascular repair reduce the risk of rupture compared to open repair in splanchnic artery aneurysms? In: Skelly C, Milner R. (eds) Difficult Decisions in Vascular Surgery. 1st ed. Cham: Springer; 2017. p. 297-307. Ghariani MZ, Georg Y, Ramirez C, Lebied E, Gaudric J, Chiche L, et al. Long-term results of surgical treatment of aneurysms of digestive arteries. Ann Vasc Surg 2013;27:954-8.